Sayako Kusaka was born in 1979 in Hyogo, Japan. She studied under Takashi Shimizu at Tokyo National University of Fine Arts and Music, under Eduard Schmieder at Southern Methodist University in the USA, and under Rainer Kussmaul at Hochschule fur Musik Freiburg in Germany. Kusaka has won the numerous prizes in the prestigious international competitions such as 1st prize in the International Yfrah-Neaman Competition 1995, 2nd prize in the "Premio Paganini" 2000, 1st prize in the Music Competition of Japan, 3rd prize in the Jean Sibelius violin competition and 1st prize in the "Rodolfo Lipizer Prize". In 1997 she received Aoyama Music Award, and in 2009 the Idemitsu Music Award. Kusaka soloed with Yomiuri Nippon Symphony Orchestra, New Japan Philharmonic, Japan Philharmonic Orchestra, Tokyo Symphony, Tokyo Philharmonic, Century Orchestra Osaka (current Japan Century Symphony Orchestra), Kyoto Symphony Orchestra, Kremerata Baltica etc. 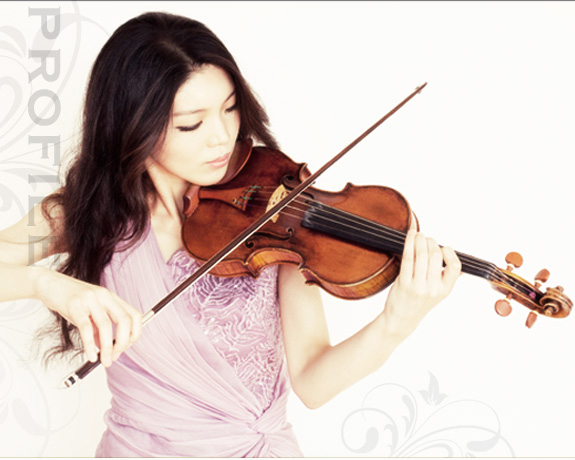 She appeared in many music festivals such as Lockenhaus Chamber Music Festival and Davos Music Festival. In 2008, Kusaka became the first concertmaster at Konzerthausorchester Berlin (formerly Berliner Sinfonie-Orchester), and in the same year, her first CD album "Sayako Kusaka Solo Violin" was released from Herb Classics (HERB-011). In 2009, Konzerthaus Chamber Orchestra Berlin was formed with Kusaka as its leader. In April 2013, she is to become the concertmaster of Yomiuri Nippon Symphony Orchestra as well, and in July (of the same year), Konzerthaus Kammerorchester Berlin plans its first Japan Tour.